Do you manufacture electric motors? Do you want some ideas on how to test them? If you’re interested in hardware product testing methods in general, you’ll want to check out our white paper: Product Testing Methods – for industrial hardware products. The goal here is to describe the testing at a level above the physical attributes, such as temperature, pressure, force, and so on, but below the level of a final assembly inside of which the electric motor resides. This region is bounded by murky lines, but staying at this level enables tangible comments. Component temperature Thermocouple, RTD, Thermistor, IR sensor, and others. A motor needs to be given electrical power to turn the motor. The rate at which a motor moves is dependent on the signal that drives the motor. Two major components are utilized: the motor controller and the motor drive. The former translates position, speed, or force (acceleration or torque) commands to the signal(s) needed to move the motor. The latter boosts the signal(s) to power levels required to move the motor. Testing these aspects of a motor often mean supplying known controller motion profiles and verifying the output signals of the controller and the drive. Since these signals are electrical, voltage and current sensors are used. Selection of the appropriate sensor depends on the bandwidth and levels needed for the particular controller, drive, and motor. The controller and drive outputs are very dependent on the particular designs and the requirements of the motor type, such as synchronous, induction, and DC. Typically, the controller outputs a slowly varying command signal that is converted into pulsing or alternating signals that excite the various motor windings. Measuring the command signal is typically done with a voltage sensor, since the rates and current levels of the drive signals are a function of frequency and voltage amplitude of the controller signal. AC motors can use typical split-core or solid ring CTs for current whereas DC motors need a shunt to measure the current. Note that AC CTs can induce a phase shift in the output signal which can affect instantaneous power measurements by mimicking reactive power when none exists. Also note that CTs provide built-in isolation from the power driving the motor, due to their inherent transformer-based design. Voltage measurements can be made where ever electrical contact can be made with the signals. Of course, these signals can be large in both voltage level and especially current levels. Beware of the connections and choose sensors properly for safety reasons. Many of these tests require a mechanical load to be applied to the motor so the motor has something to “push” against. Such loads are often either a mechanical brake, which converts the motor output energy to frictional heat loss, or a generator, which converts the mechanical energy to electricity which can then be used to drive a resistor load bank (convert to heat) or other means to dump the electrical energy. For AC motors, use a CT and PT to measure the current (I) and voltage (V) applied to a motor to form the instantaneous power P=I*V.
For DC motors, rather than a CT, you measure the current with a shunt, and compute power as I*V.
The amount of power is somewhat proportional to the motor load so tests typically automatically ramp the load to form a curve of input electrical power to output mechanical power. The “no load” and “full load” (or “blocked”) conditions are often of interest because fundamental parameters of motor operation can be obtained. For example, the “no load” phase angle between current and voltage in each phase of an AC induction motors is of interest for equivalent circuit parameters. Testing the resistance of each winding can be measured with a standard DMM. These tests help determine issues such as shorts to ground, shorts between phases, and broken windings. A high-pot tester can check for winding insulation breakdown. Sensors used are listed in the table above and applied to various components used to construct the motor, such as the housing, heat sink fins, bearings, and so on. The type of sensor to use is usually chosen based on the required accuracy, with RTDs being the best. Careful calibration and precision signal conditioning is important to get the highest accuracy from temperature sensors due to their small signal output. For rotating motors, applying an accelerometer to a motor bearing mount can assess the mechanical integrity of the bearing. Excessive vibration indicates bearing failure and the frequencies of those vibrations are indicative of the types of faults, such as bad roller bearing elements or overall looseness due to worn out elements. When two axes are measured simultaneously, say vertical and horizontal as defined by gravity, an overall mount movement can be detected if either the bearing or the mount is moving. These frequencies occur at rotational speed and the harmonics, caused either by shaft misalignment or motor unbalance. Asymmetric windings, whether mechanical or electrical, also cause rotational forces. For rotating motors, placing an accelerometer in the direction of the motor shaft can detect looseness and misalignment in the shaft. A more typical means of detecting motion of the shaft, due to run out or looseness, uses a proximity sensor. This type of sensor detects the distance between the sensor and the shaft and are almost always non-contact sensors, although some ride on the shaft surface. Non-contact version of these sensors usually use either eddy current or laser displacement methods, and one method may perform better that the other depending on the shaft material and condition. For example, the eddy current method will not work on a carbon fiber composite shaft. A high-bandwidth CT or shunt measures the time response of current draw by the motor when first powered. 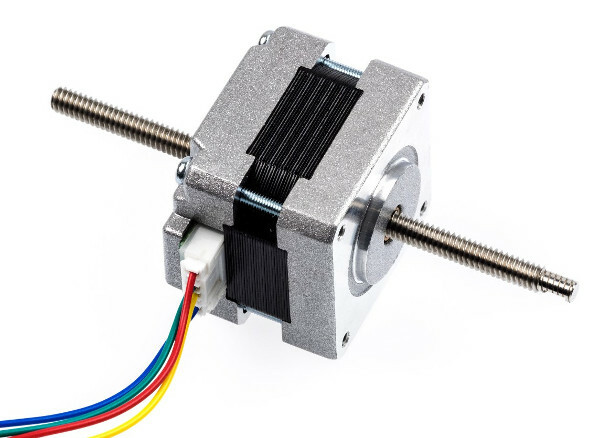 Since the motor is not moving initially, the power source is driving a very low resistance due almost exclusively to the resistance of the windings. The current in-rush returns to normal levels after the motor starts moving. The shape and peak amplitude of the pull-in current can be used as a pass/fail disposition during manufacturing tests. The time required for a motor to reach the commanded speed can be an indication of proper motor construction. The typical sensor used for this measurement is an encoder or 1/rev (once per revolution) sensor. Motors that can be speed-controlled often have built-in encoders or 1/rev sensors which the motor controller can use to detect speed. Another method utilizes a non-contact sensor, such as a proximity or laser, to measure some aspect of the motor speed. For a prox, two notches at 180 degrees apart on the shaft (to maintain balance) can produce an oscillating signal the frequency of which is proportional to the motor speed. For a laser, a reflective yet lightweight piece of tape can produce an oscillating reflectance. Also, since the run up to speed passes through all possible operating speeds of the motor, it is useful to monitor vibration during this run up in case any mechanical resonances are passed as the range of frequencies are invoked. In these situations, a slow run up is beneficial to allow build-up of low Q resonances. The same test methods discussed for run up apply to coast down as well, with the one important fact that during coast down the motor is not being powered. Thus, any torque and other forces present during run up are absent in a coast down. If you need custom test equipment to test your electric motor or just have a question about automated test of electric motors, reach out here to start the discussion. If you’re interested in other info on custom automated test systems, check out our Automated Test Systems Resources. You’ll find case studies, white papers, webinars, and articles. Automated Hardware Testing – What Automated Hardware Testing is. Why do it. Types of Automated Hardware Testing. Commonly tested products. How to do it.